It’s been a few years since I first stumbled upon the term, drooled over the aesthetic, and learned about the culture. From a writer’s perspective, it’s been an interesting ride. I didn’t start out with a steampunk novel in mind, and I hope I’ve never given that impression. However, since discovering that the world of the Aldersgate Cycle was a fantastic take on steampunk, I’ve done my own delving into the culture. I came to steampunk, as I’ve written before, by way of the American West, and through a love of fantasy and alternate worlds. While I spent some time in the early 2000s hanging around lots of punk rockers in the Baltimore area, I’ve never considered myself very counter-culture. I mean, sure. I’m weird. I’m a geek. I’ve always been a maker of words. It’s not to say that I don’t have plenty of political views that might be considered unusual, but I try not to let that leak into my blog or (too much) into my writing. What’s been interesting to watch, however, is the greater absorption of steampunk culture into the mainstream. I don’t think I’ve ever watched a progression like that before, save perhaps the goth progression in the late 80s and early 90s (though I was listening to the Beatles at that point, I certainly watched from the wings). Search trends for steampunk continue to rise, and everything from fashion to home decor shows signs of cross-pollination. But I wonder, is the definition of steampunk changing? As it becomes a known part of our culture at large, does it diminish? Or does it grow? Here’s a few scenarios I think we might see in the coming months. Gaining literary steam. I’m not the only writer out there with a love for steampunk. In fact, I see more and more writers trying their hand at incorporating alternate history/fantasy steampunk facets into their writing; we’ve seen Steampunk Tales for the iPhone, for example, and of course the VanderMeer short story collection (which, I believe, is in talks for a followup). From a novel approach you’ve got people like Ekaterina Sedia, Tobias Buckell, and Cherie Priest (among others) either publishing or actively working on steampunk-esque books. Why? While “steampunk” literature has been around a long time (well, they didn’t call it that when they were writing it in the late 19th century) it’s seen a rebirth. With appeal for fantasy, science-fiction, horror, and thriller writers, it’s not surprising to see growing trends in steampunk writing. It’s wonderfully fertile ground, and can be written in a multitude of ways. From a fantasy perspective, it’s a nice break from the standard medieval approach. The -punk phenomenon. We may start hearing about lots of other “new” punks. You’ve probably already heard of cyberpunk and dieselpunk, etc.. I know plenty of writers who hate these terms (even the term steampunk itself) but it is what it is. In a way steampunk has become an umbrella term, incorporating bits and pieces from the 17th century onward to the Edwardian, and sometimes beyond. There are definitely divided camps, here, some who believe steampunk is only Victorian, and others who want to broaden the definition. Of course, there are positive aspects of each, but I certainly see–especially in the realm of fashion–the second camp winning out. It tends to give historical nitpickers hives, unfortunately… Is “steampunk” the right term? I dunno. It is what it is at this point. Makin’ a steampunk buck. I’m sure you’ve seen it. The superfluous gear. The short story that tries too hard. That friend of yours who has become a born-again steampunk and is now making bookmarks, postcards and t-shirts all proclaiming love of the culture. Yeah, it’s tough territory here. You want to be welcoming to everyone, but at the same time, so much of what I’ve been seeing lately just comes across as people trying to make a quick buck. And I hate that. Asking the hard questions. Steampunk isn’t perfect. The Victorians, for all they gave us, were highly flawed people. They were often racist, sexist and classist. And while some writers, in particular, have explored these issues, it hasn’t really seeped into the culture. I love corsets, from an aesthetic perspective, for example. But, some of the extremes women went through–or were made to go through–in attempt to “look right” is downright uncomfortable. 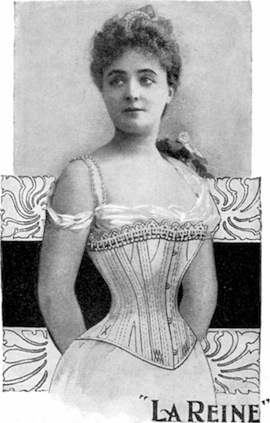 That we can choose to wear corsets or not in this day is rather amazing. Know what I mean? It’s amusing to find that one of the instruments feminists rallied against has become a symbol of feminine power and sexuality… Anyway. I digress. Not your parents’ steampunk. Steampunk will change. People will push the envelope. It’ll move beyond gears, cogs, and goggles, and become something else. It will be reinterpreted, re-envisioned, re-appropriated. It will move to Asia, to Africa, to the Middle-East, and bring new flavors, sounds, sights, and influences. And it will be better for it. I, for one, can’t wait! What about movies? I think they’ll continue to be few and far between, and of middling quality. So far, most attempts, including most recently City of Ember, have not done terribly well. There’s something steampunkish, certainly, about 9, as well as a few others (not to mention new RPGs). I mean, in the past, the outcome just hasn’t been that great. Not even I could sit through Wild Wild West again. My hope is that something comes to television, soon. I think there, steampunk might find its home. With shows like Warehouse 13, which certainly cater to the aesthetic, I’m optimistic! So, what do you forsee for the future of steampunk? Last night I recorded the last two chapters of The Aldersgate for Alderpod. But it’s more than that. Finishing a book is a weird process, especially when you’re expecting to write more later. The Aldersgate was never envisioned, to me anyway, as just one book. But, still, it’s got to be able to stand on its own. Even though some of the plot points won’t get resolved for a while, it’s important that each of the characters complete their own journeys. And I think, above all, that’s what I’m most pleased with. The book has room for tightening in a lot of places. But such are revisions. I can get away with some stuff in reading that likely I can’t in writing. Just one of the weird ways the audiobook and physical book differ. But, back to the characters. I like the way the book ends because the main characters–in this case, Cora, Emry, and Brick–really come into their own. I won’t go spoilery on you, and it’s not that they all figure it out perfectly, or that’s it’s a happy ending. It can’t really be (as in the case of Sylvan and Ellin). Anyway I’m babbling. The coffee’s not yet kicked in. At some point today I’ve got to go and put the tags on the file, and listen one more time to make sure it’s as good as I can get it. And now, this begs the question: what to do next? The podcast has been going on for the last year and change (the prologue went live on April 22, 2008). As I mentioned at the beginning, reading aloud is just a part of my writing process, and it may be that I choose to do another podcast just… well, because there’s going to be a gaping hole where Alderpod once was! Finding a little time on my hands this rainy day, I have recorded Chapter 22, Alderpod #24. I am trying hard to make up for lost time, and now that the book is creeping toward the final climax, that’s only fitting.